Each year since 1999, the Amador County Arts Council, aka AmadorArts, has recognized community members who have contributed their time and energy to promote, encourage and support the arts in Amador County by awarding deserving individuals the Patron of the Arts award. On August 17th at last TGIF concert of the summer, this prestigious award was presented to Diane Olsen of Sutter Creek who has contributed to the arts in our community since 1976. Diane’s love of the arts began when she attended Chabot College and Cal State Hayward. While there she enrolled in numerous art classes including, pen and ink drawing, stain glass and clay sculpture. In 1976, she moved to Amador County where she continued her love of the arts by creating a studio in her home where she conducted step-by-step stain glass workshops for her friends. She soon became involved with the Volcano Theater Company and performed in several plays including Harvey, Blithe Spirit and Night of January 16th. Diane also volunteered for the FAME school program (Fine Arts Mini-Experience) where she would go into classrooms to familiarize students with well-known artists, composers, and their works. In 2008, Diane became an AmadorArts Director. While a director, she worked tirelessly to help raise funds for the AmadorArts programs. Diane hosted the popular Garden Party for several years, volunteered at the T.G.I.F. 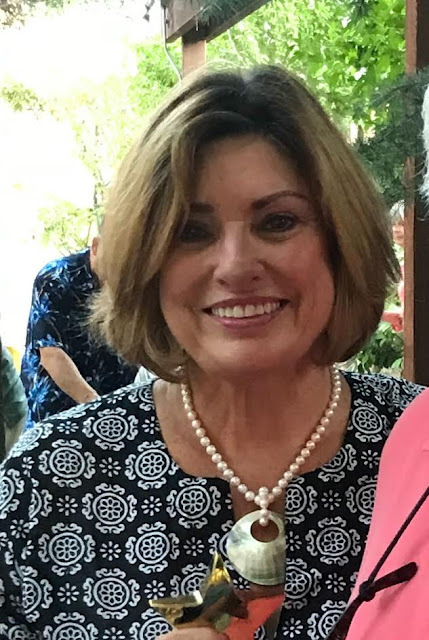 summer concert series, was a classroom volunteer for the Arts in Education Program, helped with registration for a Taste of the Arts, and was the decoration committee chairperson for Winefest, the annual arts fundraiser held the second Saturday of November. Diane continues to be an active volunteer for AmadorArts. She loves to travel and enjoys the arts where ever she goes. Diane, this is a well-deserved award. You are the best! Congratulations!! !